When a text message comes in, the stock email app throws a copy into my Exchange email accounts that are on the phone. I want to turn this feature off but cannot find a setting for it anywhere. I have a Galaxy S5. What's even worse is that it's not just a combined view; the text messages are actually inserted into your Inbox, so your private text messages sync back to your corporate email account, so they show up in Outlook on your PC, and they're available for your company's Exchange administrators to snoop on! 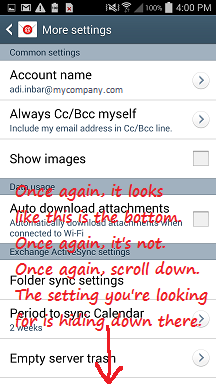 It's probably the most annoying anti-feature I encountered when I first got started with Android. The setting to make it stop doing that is there, but they hide it really, really well. Not only is it in an unintuitive location, but in order to get there you twice have to scroll down to hidden portions of the screen where there are no visual cues that indicate that there's anything more down below. Select Settings from the menu (the soft button in the bottom left corner, not the hamburger menu in the top left corner). 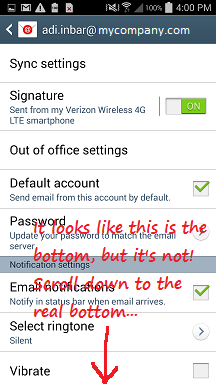 You'd expect to find it here under Sync Settings, presuming that this was designed with common sense, right? Well, you'd be wrong. Scroll down to find a hidden More settings button at the bottom, and tap it. 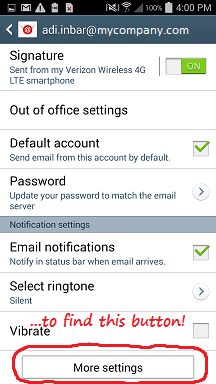 On the More settings screen, scroll down again. 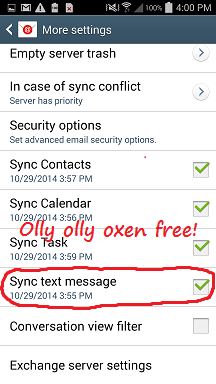 Find the Sync text message setting, and uncheck it.